This article is about the box from Super Mario 3D Land. For the item from the Paper Mario series with the same name, see Mystery Box (item). 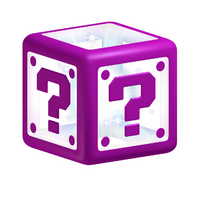 A purple, transparent box with a question mark on the middle. Mystery Boxes are boxes Mario can access in Super Mario 3D Land and Super Mario 3D World. In the former game, they are found in most Worlds, with their primary task being to defeat all the enemies in the box within ten seconds. Enemies can range from Goombas to Boom Booms. When Mario completes the task, Coins and a Star Medal appear. Other items, such as 1-Up Mushrooms, Super Leaves and Fire Flowers are also found within Mystery Boxes. However, if Mario loses a life in a Mystery Box, he will be forced to quit the level. Whenever the player encounters a Mystery Box on the world map, they are required to enter it before moving on. The Mystery Box theme is a remix of the Teleporter theme from Super Mario Galaxy 2. A golden Mystery Box. Note that there are two Star Medals and even a P-Wing. Mystery Boxes can also be golden on the inside, while still appearing purple on the outside. All of the golden-sided Mystery Boxes contain two Star Medals, and at least three 1-Up Mushrooms, with some containing as many as eight. No golden-sided Mystery Boxes contain enemies, and as such, Star Medals appear immediately upon entering a box. They can contain many different things, such as Poison Mushrooms, Toads, or even P-Wings. These Mystery Boxes have a cover of the main theme from Super Mario Bros. as the background music. There are a total of 20 unique normal Mystery Box contents and 15 unique golden-sided Mystery Boxes contents. Golden-sided Mystery Boxes are less likely to appear than normal ones. Each normal Mystery Box can be found in two different Worlds, while each golden-sided one can only be found in a single World. After completing a Mystery Box, it turns gray on the overworld map, "falls asleep", and becomes inaccessible. It may be accessed again 20 hours later. The contents of each Mystery Box changes each time it is re-entered. Mystery Boxes can also be accessed via StreetPass (a wireless feature that automatically exchanges information with other 3DS holders while the system is in sleep mode). The only difference in a StreetPass Mystery Box is that it is guaranteed to have a Star Medal or two, unless of course all Star Medals have been collected. Mystery Boxes also can appear in some levels of Super Mario 3D Land, which the goal is to collect as many coins from the blocks within the time limit. In the early versions of the game, these Mystery Boxes used the same design as that of the current Warp Box; similarly, the early Warp Boxes used the current Mystery Box design, albeit with an exclamation point instead of a question mark. The colors were switched in the final version of the game. Mystery Boxes in Super Mario 3D World can only be found in levels. Each of them has a Green Star which must be collected within the time limit. If Mario fails, he is sent back to the proper level. The Green Stars must be collected in different ways, like defeating every enemy present, navigating through a small obstacle course, or using given items or forms to reach it. Certain worlds also feature special courses called Mystery Houses, which consist of clearing a number of Mystery Box courses in quick succession. In one area of the Shifty Boo Mansion level, the Boo painting is the real Mystery Box and if the players pick the Mystery Box, it becomes a decoy and a Boo will appear to distract Mario. Mystery Boxes also appear in Captain Toad: Treasure Tracker, appearing only in Coins Galore bonus levels this time. After entering a Coins Galore level, Captain Toad or Toadette can select two Mystery Boxes: one that access a bonus area with Super Pickaxes and other that access a bonus area with Double Cherries. The task is to collect many coins or Gold Mushrooms within 10 seconds. After completing a Coins Galore level, it cannot be entered again. However, if the Toads complete every level of the game, these Coins Galore levels will be permanently open and can be accessed at any time from the Bonus Episode. Three Question Blocks, and two Hidden Blocks, two of which contain a single Coin, the other of which continues to produce coins as long as time remains on the Box's timer. The Hidden Blocks appear where there are gaps between the ? Blocks. Found in World 1-3. Three long Question Blocks containing two Coins and a Super Leaf, a single set of three Coins, and multiple sets of three Coins respectively. Found in World 1-4. Three Roulette Blocks. A yellow Toad will also be found here and will give a 1-Up Mushroom if the player watched his entrance into the hidden Box through a pair of Binoculars. Found in World 6-1. Three Coin throwing Rocky Wrenches and a Star Medal. Found in World 8-5. Forty-five Brick Blocks each containing a coin, three Hidden Blocks each containing a coin and one Hidden Block containing a 1-Up Mushroom. Found in Special 1-3. Defeating every enemy in a Box will cause 15 Coins and a Star Medal to appear. Three Goombas. Found in World 1 and Special 1. A red Biddybud walking around a Fire Flower. Found in World 1 and Special 3. A Fire Flower, a Goomba Tower, two Goombas high, and a Fire Piranha Plant. Found in World 2 and Special 3. Two Tail Goombas and a Piranha Plant. Found in World 4 and Special 5. A Goomba and a Piranha Plant. Found in World 4 and Special 5. A yellow, green, and red Biddybud, a Fire Flower, and a Super Mushroom. Found in World 6 and Special 7. Two Fire Piranha Plants and a Fire Flower. Found in World 2. Two Tail Goombas and a Super Leaf. Found in World 2. A Biddybud of each of the species's five colors walking in a circle. Found in World 2. Two Goomba Towers, two Goombas high each. Found in World 6. A Hammer Bro and a Boomerang Flower. Found in Special 1. A Goomba and a Super Leaf. Found in Special 1. A Boomerang Bro and a Boomerang Flower. Found in Special 3. A Hammer Bro and a Boomerang Bro. Found in Special 5. A Hammer Bro, a Boomerang Bro, and a Boomerang Flower. Found in Special 7. Three Fire Piranha Plants. Found in Special 7. Boom Boom requiring only one hit to defeat. Found in Special 7. Two Goomba Towers, two Goombas high each, and a Fire Flower. Found in World 2, World 4, and Special 7. Two Goomba Boards and a Fire Flower. Found in World 1 and World 6. In addition to the features listed here, each Box contains two Star Medals. 15 Super Leaves and a P-Wing. Found in World 1. The game's five supporting Toad characters. Found in World 1. Nine Goomba Boards, five of which contain 1-Up Mushrooms and the others, Coins, and a Fire Flower. Found in World 2. 10 Crates, 4 of which contain 1-Up Mushrooms, and two Question Blocks containing a Super Leaf and a Fire Flower respectively. Found in World 4. 12 cacti, four of which contain 1-Up Mushrooms, and a Boomerang Flower. Found in World 6. Seven white dandelions, four yellow dandelions containing 1-Up Mushrooms, and a Question Block containing a Super Leaf. Found in World 6. Four P-Switches pressing each of which causes a 1-Up Mushroom to appear. Found in World 6. Seven 1-Up Mushroom Boards, four of which contain real 1-Up Mushrooms, a fifth 1-Up Mushroom, and a Question Block containing a Fire Flower. Found in Special 1. Six 1-Up Mushrooms and six Poison Mushrooms. Found in Special 5. 12 Question Blocks containing Coins and four invisible Question Blocks containing 1-Up Mushrooms. Found in Special 5. Three Question Blocks containing 1-Up Mushrooms and a Question Box. Found in Special 7. Four unlit torches and a Fire Flower. Lighting the torches causes four 1-Up Mushrooms to appear. Found in Special 7. 1-Up Mushrooms. Found in Special 1. Flowers, some of which contain 1-Up Mushrooms. Found in Special 3. Plants, some of which contain 1-Up Mushrooms. Found in Special 7. ↑ Super Mario 3D Land: E3 2011 Beta. YouTube. Retrieved February 17, 2017. ↑ Shogakukan. 2015. Super Mario Bros. Hyakka: Nintendo Kōshiki Guidebook, Super Mario 3D Land and Super Mario 3D World sections, pages 186 and 233. This page was last edited on February 21, 2019, at 21:30.